Our name tag vendor recently doubled the price for our orange engraved name tags. Because of this, Marketing & Communication put out bids for new vendors. A small committee of office representatives, who use name tags often, reviewed those bids and a new design. 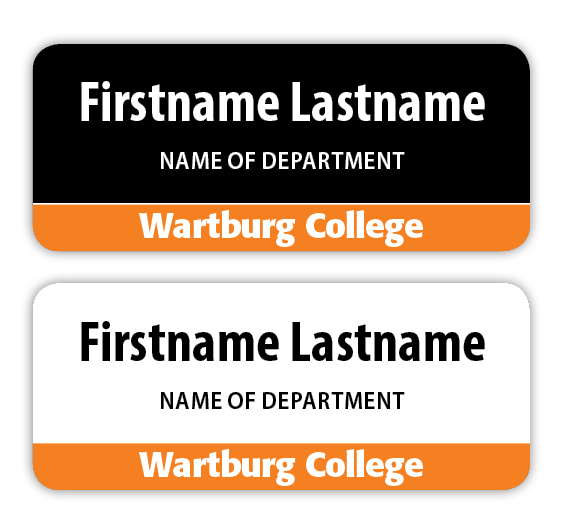 The new name tags, shown here, will be metal with the same magnetic back. They will be available in either the black or white design, and the cost will be $4.50 each, plus shipping. Departments/offices are NOT required to order tags, but all orders from this point forward will be placed with the new vendor. Desk plates, door plates, and holders will also be ordered from the new vendor. More information about ordering will be sent to office coordinators. Direct questions to Joni McDonough, office coordinator for Marketing & Communication. Saturday’s “Stars of Wartburg” symphony concert has been rescheduled for Monday, April 16, at 7:30 p.m. in Neumann Auditorium. 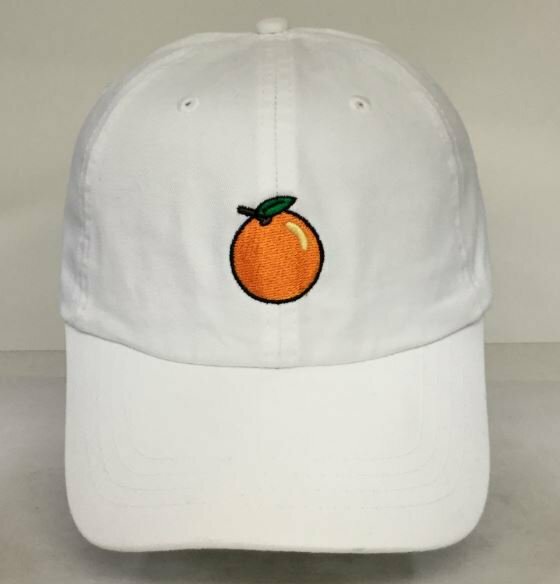 Were you a little jealous when you saw people in their orange emoji “dad” hats on UKnight Day? Want to get your own? Students UKnight is selling the hats for $15 each. The hats are one size fits all and you can pick between black or white. We need a minimum order of 48 hats. Click here to order; the deadline is April 23. The Department of Religion & Philosophy will celebrate National Grilled Cheese Day on Monday, April 16, 11 a.m.-1 p.m., in Grossmann Suite 101. There will be no Juice during Tour Week. The next Juice email will be April 30. The deadline to submit items is 4 p.m. Thursday, April 26. The Mail Center will be open regular hours during finals and Tour Week, with the possible exception of the afternoon of Wednesday, April 25. Hours that day will depend on staffing, due to the staff retreat. If your department will be closed or have limited open hours for mail delivery during finals, Tour Week, or May Term, contact Kory Figura so we can appropriately adjust the delivery schedule. Federal tax returns must be postmarked by Tuesday, April 17, this year to be considered on time. The Mail Center can postmark your return, but it must arrive at the Mail Center PRIOR to 3:30 p.m. on Tuesday. Returns dropped in the mailbox after 3:30 p.m. on Tuesday will not receive an April 17 postmark. Dr. Cynthia Bane, professor of psychology, will teach mindfulness meditation classes for faculty and staff members during May Term. Classes will meet for one hour per week and will be scheduled on Tuesday or Thursday afternoons. No prior experience with meditation is necessary. To indicate a day and time preference, respond to the survey at this link. Direct questions to cynthia.bane@wartburg.edu. If you’ve wanted to attend meetings of the Sharing Teaching and Advising Strategies group but schedules wouldn’t allow, consider joining us during May Term or during the summer. All are welcome. The meeting schedule is posted on the STAS myWartburg group page. Contact LeAnn Faidley or Michaeleen Golay to be added to the group. Concordia University in St. Paul, Minn., will host the annual Conference of the Association of Lutheran College Faculties on Friday, Sept. 21, and Saturday, Sept. 22. More information, including the Call for Papers Form, can be found at this link. Papers from any and all disciplinary perspectives are welcome. Please consider the topics listed on the website a starting place rather than a limitation. The U.S. Department of Education requires institutions receiving federal funding to provide notice regarding how to register to vote. Directions on how to register to vote can be found here. Read about the updates in cabling work and door hardware installation. Go to the Security Update on the InfoCenter to read more and see previous reports. Wartburg S.A.F.E. (Suicide Awareness for Everyone) will host a Stress-Free Zone on Wednesday, April 18, 1:30-3:30 p.m., on the Campus Lawn. Join us for relaxation, yard games, and dogs! The rain location will be in Chapel Commons. Direct questions to safe@wartburg.edu. The Department of Music Therapy will host an evening of live music and karaoke at Sasquatch Jacks on Tuesday, April 17, 7-9 p.m. The Squatch Jam will be a community fundraiser for Bremwood Residential Treatment Center. Suggested $5 donation at the door. Come and celebrate the semester for a good cause! Contact Sammie Hallgren with questions. Professor emerita Janice E. Wade, 80, of Waverly, Iowa, passed away Tuesday, April 10, at her home in Waverly from a rare unknown neurological disorder. She was Music Director and Conductor of the Wartburg Community Symphony from 1987 to 2011. Memorial services and a memorial concert tribute by the Des Moines Community Orchestra will be held at a future date. Click here for the obituary. Sunday Worship and Weekday Chapel have concluded for the semester. Wednesday Night Sanctuary will continue through May Term. Todd Coleman, assistant vice president for admissions, has been selected to serve on the Hobson’s Intersect Higher Education Advisory Board. The members offer insight into higher education trends and issues in addition to product evaluation. Hobson’s is a provider of secondary and higher education products that assist students in career and college engagement. Coleman also will serve as the admissions representative on an NCAA Athletic Recruitment Panel on Monday, April 16, at Dowling High School in West Des Moines. The focus will be to prepare students and families for the various types of institutions and recruitment advice for each. In addition, Coleman recently completed serving as chair for the 2018 Waverly Chamber Project Lead class, which will graduate May 6 at Wartburg. There were 16 participants in this year’s class, including Chris Knudson, director of marketing & communication, and Katie Wyman, admissions counselor.